Richard Linklater stretches a little too far outside of his comfort zone, and the result is that Last Flag Flying turns into an odd combination of Little Miss Sunshine and Going in Style, an emotional road trip where death is a constant companion. What he does right is add in a ton of morbid humor to lighten the load and to highlight the intensity of the topic he attempts to share with us. What he does wrong is leave out any real reason for audiences to dive into the hell that his characters have gone through and are currently going through, leaving us outside while these three men deal with problems deep within. It’s as if we were invited to the viewing but not the funeral, like distant acquaintances instead of close friends. Soon after his wife dies of cancer, Doc Shepard receives more terrible news; his son was killed while serving overseas in the Marine Corps. Doc is a veteran himself, Navy, doing his duty in Vietnam with thousands of other American boys, none of who knew what they hell they were doing there. All these years later, Doc has to bury his son, but he doesn’t have the family and friends he needs to help him with the difficult, emotional task. So he looks up two old friends from his days in ‘Nam, hoping that they will be there to hold him up when it gets really tough. Sal owns a bar, drinks too much, lives recklessly, but is fiercely loyal and honest. Mueller has left his dark days behind him, became a preacher, lives by God’s will now. The trio of old friends will go on a road trip to complete the sad task, but will have to confront the past head on while they travel. I like Linklater, I just don’t think he was the right director for this film. Apparently there are more stories written by the same author whose book this movie is based on, and one of them was turned into a film starring Jack Nicholson. If Linklater was inspired by that and wanted to give us more/a more modern take, he failed to breathe life into the tale, and it generally fell flat. There was nothing terrible about the film, I actually liked it, but there is definitely nothing to love. The plot is dialogue-driven, and the actors pull off their long, deep conversations about the past and death and the Corps and getting old. But there isn’t a compelling reason to keep listening once the point is made. Cranston is the entertaining jerk, Fishburne is the guy with the morals, and Carell is a bit of a straight man, but it works, and there’s one excellent, funny scene that feels completely honest that won be over for a moment, though the moment was fleeting. 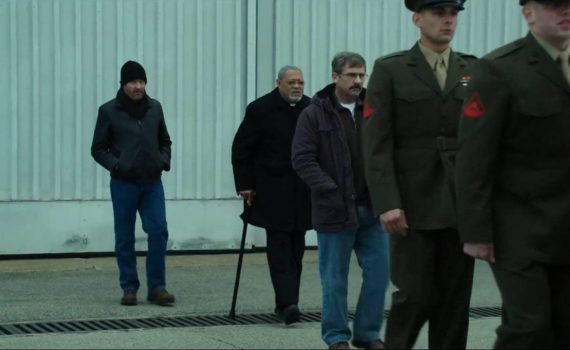 Overall, Last Flag Flying is a bit of a disappointment, at least based on talent and theme involved, settling for good when it probably should have been great.